On February 17th , Danny Garcia (33-1) will face Brandon Rios (34-3-1) in a Las Vegas hosted WBC welterweight title eliminator. David Benavidez (19-0) will also be facing Ronald Gravil (18-2) for the WBC super middleweight title on that same card. On May 19th, Keith Thurman (28-0) will defend his WBA welterweight title at the Barclay’s Center against an opponent who has yet to be officially named (though many believe it will be 28-2 former titlist Jessie Vargas). “I’m truly looking forward to being back in the ring May 19,” said Thurman. “After that, I’m going to bring a more exciting fight later on this year.” On that same date, Adonis Stevenson (29-1) will battle Badu Jack (22-1-2) for Stevenson’s WBC light heavyweight title in Canada. Lastly, on June 9th, Leo Santa Cruz (34-1-1) will rematch Abner Mares (31-2-1) for the WBA super featherweight title. 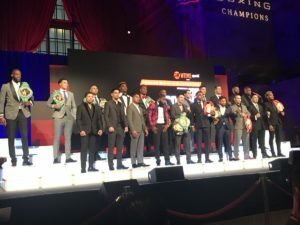 Jermell Charlo (30-0) will also be facing a yet to be named opponent in defense of his WBC super welterweight title on that same Staples Center card. “It’s been two years since I fought Leo Santa Cruz,” claimed Mares, “and all I’ve been thinking about is redemption.” Charlo had a few unique words of his own to add. “I’m going to stay fly, get my body count up and let that lion roar,” he said. All of the PBC fights mentioned will be aired live on the Showtime pay cable network.